Pictured at the Bowl Final (left – right) are: Federation Vice-Chairman Beth Irwin, Magazine & Leisure Sub-Committee Chairman Ann McCurdy, Federation Chairman Elizabeth Warden, runner-up Elma Irwin of Macosquin WI and the winner Evelyn Robb of Loughbrickland WI. WI Bowler Of The Year! 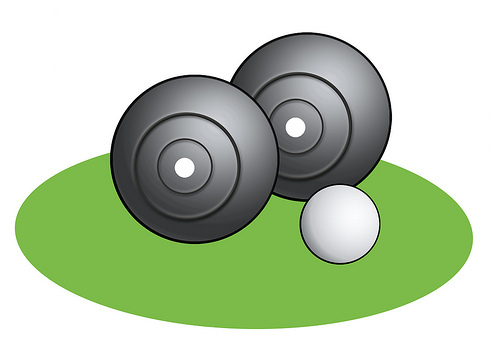 On Saturday 19th March twenty WI Area bowling teams met at St Andrew’s Parish Church Hall in Killyman, Dungannon for the annual Federation Bowls Final. Magazine & Leisure Sub-Committee Chairman Ann McCurdy opened the proceedings with a warm welcome to all the competitors and introduced Mr Gibson Peak, the umpire for the day. The round one winners were Rowallane, Quoile, Abercorn and Ranfurly. A well-fought round two resulted in eight winners, namely Gosford, Lower Bann, Roe Valley, Ranfurly, Knockagh, Slemish, Lisnagarvey and Iveagh, who went on to play for a place in the semi-finals. The successful teams were Lower Bann verses Roe Valley and Knockagh verses Iveagh. Competition was tough, resulting in Elma Irwin for Lower Bann and Evelyn Robb for Iveagh going through to the final round. The two ladies fought a spirited match and the winner, taking home the Milk Marketing Board Salver, was Evelyn Robb. Ann expressed thanks to the church and Killyman Bowling Club for the use of their excellent facilities and their assistance with all the planning leading up to the event. Ann also thanked the ladies of Killyman WI who provided the delicious food; their hard work was much appreciated. The members of the Magazine & Leisure Sub-Committee wish to express thanks to the competitors who played so valiantly and ensured the day was a great success. A special thanks also goes to our Federation Chairman, Elizabeth Warden, who presented the awards on the day. We look forward to next year’s competition and congratulations once again to the 2016 winner, ‘WI Bowler of the Year’ Evelyn Robb of Loughbrickland WI. 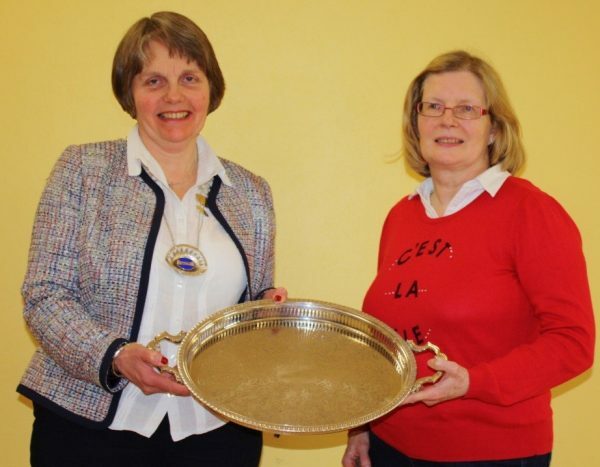 Federation Chairman Elizabeth Warden presenting the Milk Marketing Board Salver to the overall winner of the Bowls Final, Evelyn Robb of Loughbrickland WI who represented the Iveagh Area.